One of the hardest tasks I have found for teachers is the integration of the technology skills (NETs) that students must have. We often see teachers working with students on word processing documents or Power Points but regularly neglect to teach the essential skills. I find that it is not because they do it intentionally. They do it because they just don't understand how it integrates into their curriculum. This is where NC Kaleidoscope comes to the rescue. Designed for grades 5-8 there are tools to help teachers, students, parents, administrators, guidance counselors. and staff development coordinators teach those required technology skills from the Technology Skills Curriculum. What I think is the most beneficial parts of the site are the week-by-week tutorials that teachers can use with their students to work on the essential technology skills at the specific grade level. For example in 5th grade students work their way around an amusement park working on things like spreadsheets, multimedia presentations and more. The site takes it one step further and shows teachers how each weeks lesson can be integrated into what is being taught that week so that the teacher does not feel like they have to give up class time. The point that the site likes to make is that the integration of technology skills into the daily curriculum is easy. It is a matter of changing just a few things that teachers do everyday like providing for alternate forms of assessment, cross-curriculum integration projects or effective ways to monitor students in a computer lab setting. It is a very valuable site for both you, your staff, students and parents. In today's Smart Notebook 10 Video, I demostrate one of the most requested features in the new version, The Shape Pen. Secretly I have a dream to be with the mustached one known as Alex Trebek and take down Ken Jennings as the most winningest person on Jeopardy history. However, deep down I know my dream may never become reality. But I can get a little a closer (and so can you and your students) with JeopardyLabs Online. Before now there were two ways to play this highly interactive game in the classroom. You could buy the actual game with controllers, scoreboard and question cartridges. Often, I have found, that teachers need lots of help setting that up. The other way was through Power Point. I can not tell you how many Jeopardy templates I have for all sorts of grade levels. I usually do a workshop to teach teachers how to make them. No longer! JeopardyLabs does the work for you. Now teachers and students don't have to worry about making sure slides are linked correctly or making sure the questions disappear after they are answered. All you need is to go online, fill out the board with your dollar amount, categories and questions and you are ready to go. I created one in about 10 minutes! But JeopardyLabs takes it one step further in that you can share your board with other teachers and you can search boards other teachers have made. Looking for weather, Civil War, or Romeo and Juliet? There are several boards that others have all ready made. So if you are in a pinch use the search and find your board. But what if you find a pre-made board but one or two of the questions don't suit you. No problem! You can edit it and save it as your own! But wait there is more! How is this site kid and classroom friendly? There is no registration! All you need to do is pick a password so if while you are building you need to come back. No need to create email addresses for your class. This could be a great way for kids to interact with each other and demonstrate learning after a lesson or unit. Here is a board that I modified as if I was teaching a unit on Chemistry. I simply searched for Periodic Table, found what I wanted and modified it for me. 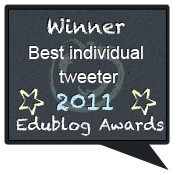 I encourage you to add this site to your arsonal of creative ways to assess student learning. A new blog on Cyberbullying, cell phones in the classroom, and other technology topics has recently come across my desk. Mike Tully specializes in education law and has created Substantial Disruption, a place where educators, lawyers, and other members of the education community can come together to talk about technology in education, specifically on topics like cyberbullying. "This is a place where legal and educational professionals can meet to discuss ideas, share information and research, and even share drafts of articles. This blog and its parent website represent one channel in a growing number of sites devoted to the issues brought to us by cyberspace. However, the goal of this site is to help educators and lawyers meet and greet in cyberspace and help each other define the rules for our brave new cyberworld. Attorneys who are involved with schools have a perspective that educators don’t share, and vice versa. Neither discipline, acting alone, is likely to make any progress toward a world in which we balance Internet-based expression with the need to provide safe schools and secure learning environments." There are some very interesting posts here. I encourage you to check it out! A new feature here on the Web 2.0 Classroom is instructional videos aimed at helping teachers get the most out of technology in their classroom. In today's video I talk a little about one of the new features in Smart Notebook 10, the Magic Pen. When I was teaching middle school science I was notorious for letting my kids out late for their next class. We either got caught up in a riveting discussion or in an exciting lab, that time just got away from us. Well, that comes to an end with Class Timer. The Class Timer is a simple, web-based appilcation that allows you to either count up and use it as a stop watch, or count down and use it as a timer. 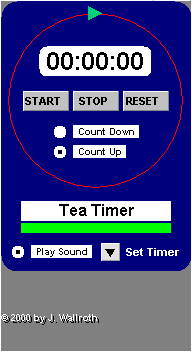 You can give the timer a name and even have it play a sound when the timer is finished. If you are like me you have lots of flash drives and external hard drives storing multiple copies of your documents, pictures, lesson plans, etc. Sometimes it can be a pain. I often leave my drives on my desk in my office and then either have to drive 40 minutes back to get them or suffer until the next time I am around. There has to be a better way? Now there is. There are lot of online backup storage solutions out there. Some are really easy to use but cost a fortune. Others only allow you to back up all at once and retireve all at once. There is a much better option out there in ZumoDrive. I have been testing/using ZumoDrive for about 2 months now and it is awesome! I never have to worry about forgetting my drives on my desk, loosing my work or worrying about my drives crashing. I can access my files from anywhere I have an internet connection, including my iPod. When you signup and install ZumoDrive a new drive appears in your drive list. All you have to do now is drag files there and ZumoDrive does the rest. You can then access those files through that drive or from your online account. You can even share documents via a link that you can send out to colleagues and friends. But what if you want to make changes to a docuement? Simply open it from your ZumoDrive, make your changes and save. ZumoDrive will re-sync with tbe new settings. Storage starts at 1GB for free and goes up from there. But 25GB is only 7 bucks a month. That is the perfect size for most users. Quick! Name five famous discoveries honored by the Nobel Prize…(crickets chirping)….Um, Al Gore won one, right? Ask your students and you’ll likely get a similar response. The people at Nobelprize.org decided that they didn’t want children growing up not understanding the significant accomplishments honored by the Nobel Prize. By visiting the educational outreach section of the website, you can introduce your students to these accomplishments in a fun and engaging way, as well as teach your course content. The site offers several interactive activities for each category of Nobel Prize — physics, chemistry, literature, medicine, peace, and economics. There are games, readings, and simulations in each section. In my class, I’ve used the blood typing game to help students understand the differences between blood types. In the physics section, there is an interesting simulation about microscopes. By using this, you could show students what the different types of microscopes can do. There is also a microscope quiz that could be used to assess understanding. Another neat feature is the readings. In the DNA-RNA-Protein reading, for example, you can select a “Basic” or an “Advanced” text. This would be excellent for differentiating instruction. Lest you think this site is only good for Science, there is a section about the Nobel Prize in Literature, and a game about William Golding’s classic, Lord of the Flies. I’m kind of a science guy, so I didn’t do so hot on that game; maybe your high school English students will do better. Regardless, you will find this site useful. Comics and graphic novels are a time-tested method of storytelling, and Pixton is a flash-based comic creation tool that is easy, free, and fun to use. Once you create your account, you can browse other users’ comics, or create your own. You have three options for creating your own comic: Quickie has predetermined sets and characters, and the user enters just text. Regular allows you to choose from a variety of backgrounds, and characters, and alter just about everything in the scene. Reposition your characters, by moving individual body parts, zoom in or out, and add your own text. (Sorry comic sans fans, that font is not an option.) Large Format is a one-scene mode. Have students use Pixton to illustrate their ideas, as a project for a literature circle group, or to explain the results of their most recent science lab. Foreign language teacher? Teach idioms and humor in their native format, and have the students make their own jokes. Create a comic to illustrate your classroom expectations. The options abound. In addition to the free version, Pixton also has a licensed option for schools. For one dollar per student per month, you get more privacy controls, the ability to message between students and teachers, and some other customization. 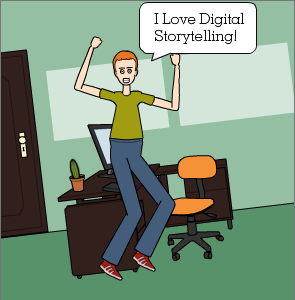 Digital storytelling is here to stay, and Pixton is a great tool for the task. The web is an expansive collection of the good, the bad and the ugly. Wouldn’t it be great if our students could search online in a safe environment? What if teachers could focus student searches towards specific resources? Sounds complicated and full of java scripts and html? Welcome to the happy collision of Web 2.0 tools and Google! The Google Custom Search Engine option turns out to be surprisingly easy to set up to search only selected web sites. Once in a while I come across programs or websites that can completely change the way we teach. And I do believe I have found this with Timetoast. Do you have students create timelines? Creating timelines can be a time consuming, and, let's face it, boring. Not with Timetoast. Timetoast is an online, interactive, timeline program. Using a free account students and teachers can create a wide range of interactive timelines. In the example below a student has created a timeline of the NASA Space program. Each dot represents information entered by the student. When you move across the time line you see the event that corresponds to that date. Cool Huh? But timetoast takes it one step further allowing users to link events on their timeline to other websities like videos, interviews, or pictures. Now that is cool! Another great feature is that once you create your timeline you can share it with others with a simple web address. So students can share with other students and teachers can share also. There is not a feature yet to make timelines private but that is coming. In the mean time check out Timetoast and timeline to your heart's content! Do you have pictures of your students taking up hard drive space and you don't know what to do with them? Would you like to create digital slide shows for your parents and students for the end of the year celebrations complete with hip transitions and music? Fear you don't know how? Fear not! Animoto is the perfect site for you. Check out this Animoto I created in less than 5 minutes. What to create your own? I have created a guide that you can view below. Recently Smart Tech, the makers of our Smart Boards, has up dated the Smart Notebook software to Version 10. While there are not a lot of differences there are a lot of new tools that can really change the way you create lessons in your classroom or foster that interactivity. Below is a presentation I recently gave on the new features in Smart Notebook 10. I often times see students searching the web for that perfect picture to use in a report or presentation. While Google Images is great, its not really fun. Then there is Tag Galaxy. Students (or teachers) enter a "tag," a search term into the engine and press go. You are presented with the results of your search organized into a galaxy. 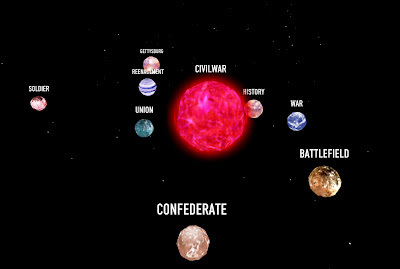 Below is my search on civil war. Google Earth Lessons-A great resource created by a teacher. Includes lessons for lots of subject areas including math, language arts science and social studies. There is also a great how-to section. The Google Earth Classroom-This one has a lot of great lessons but is more designed for K-6 classrooms. Also a great how-to section for both teachers and students. Google Earth Lit Trips-With the Language Arts teacher in mind, this site takes students on literary journeys found is texts they read in the classroom. Books for all grade levels and a very easy to use search function. 21 Ways To Use Google Earth- This is a presentation on 21 different ways to use Google Earth in the classroom. Very cool! 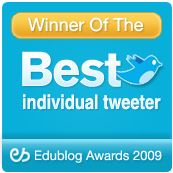 Welcome to the new home for everything you ever wanted to know about Web 2.0 Tools and the classroom. 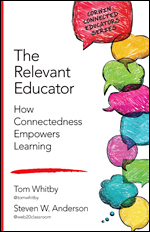 Here I hope to offer some insight into what it means to have a "Connected Classroom." I am going to offer tips and tricks you can use in your classroom, video tutorials, and some awesome websites I come across. Please do not hesitate to get in touch with me to offer suggestions.